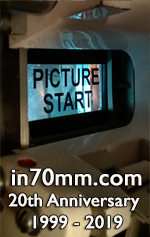 5th 70mm film festival in Krnov: say KRRR! wide and aloud! It was for the fifth time that lovers of widescreen entertainment can enjoy another 70mm event which took place in Krnov during first weekend in April 2010. On the way to the cinema Mir 70. Notice the design of fingers forming “70”. With regard to 65th anniversary of the end of World War II we have selected for our festival two titles, which not only somehow reflect war theme but it also will be their cinema premier in the Czech Republic. The first was a biographical epic film "Patton" (1970) and the second was war spy drama "Operation Crossbow" (1965). On Friday’ opening night after the “kino” premiere of "Patton" we have talked the audience into agreeing on participating in audience-on-stage photo. It was something that has not been done in previous years of our festival but the idea met with overall enthusiasm from almost every visitor and since they like coming to KRRR!, the number of our faithful patrons and newcomers rose to approximately to 170 accredited visitors this year. Thank you! From time to time we, even must screen some faded, though rare prints never seen in the Czech Republic before but believe it or not, these have almost the best show-up every time. We also managed to attract some more audience by bringing “Aliens” to screen so we keep up the good work by showing all films from trilogy. To that, it is a pleasure to thank to Mr. Duncan McGregor (Pictureville Cinema, Bradford, UK) for letting almost packed house (approx. 290 viewers) experience, even though too loud, “slimmy” 70mm print of “Aliens”! Dr. Jochen Rudschies and Miss Anna Rudschies. Friday night – say KRRR! Audience on the stage and Pavel Tomešek in the middle. Mr. Francois Carrin and Mr. Jean-Luc Peart (both France). Mr. Hans Hänßler giving introductions. Mr. Francois Carrin giving introductions. Mr. Clemens Sherer and Mr. Hans Hänßler (both from Germany). Audience is getting ready for evening show of “Aliens”. On Sunday afternoon KRRR! gets sorrier, since the true 70mm celebrities on metal reels are leaving.